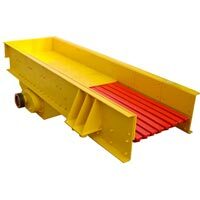 ZENITHVibrating Feeder is designed and built to withstand the toughest work in a quarry or mine by matching different applications; This vibrating feeder series is designed particularly for continuous use with any hard and abrasive materials through uniform flow. Vibrating feeder works to continuously and evenly feed lump, particle and powdered materials from hopper to belt conveyer, bucket elevator, screens and crushing machines, etc. Steeples regulation is available for ZENITH's vibrating feeder to automatically and centrally control the feeding volume. Vibrating Feeder can continuously and evenly send materials to crusher and roughly screen them. The company Vibrating feeder matches crushing and screening machines in many areas, such as metallurgical industry, coal mining, mining-selecting, building ,chemical and grinding industry, etc. 1, Our vibrating feeder is of highest capacity for the same deck size in industry. 2, Sub-resonance tuning to guarantee efficient, continued operation as deck liners wear. 3, simple structure, easy to adjust and to maintain. 4,Infinite variety of sizes and custom configurations, typically up to 600 t/h to suit your requirement. 5,Our vibrating feeder is added closed frame, it can largely reduce pollution and noise.